Savings bonds earn a guaranteed rate of interest. 3. Do You Have to Claim Tax-Exempt Interest Earned? 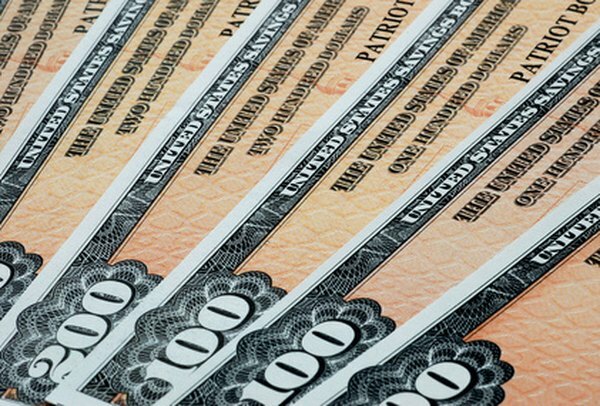 U.S. savings bonds appeal to investors who want a guaranteed return. Your investment is not subject to fluctuating interest rates or stock values; you buy a savings bond for a discounted price and redeem it for face value at maturity. Unlike a share of stock or interest in real estate, the money you earn on savings bonds counts as regular income, not capital gains. The interest becomes part of your gross income, taxed at your regular tax rate. Savings bonds begin earning interest after the first year you own them. If you need to cash in a bond before its full maturity date, you’ll be paid the price you paid for the bond, plus the interest earned to that point. You can consult tables published by the U.S. Treasury to calculate the value of your bond. The IRS gives you two options for reporting the bond interest as income; the method you choose depends on personal preference and the impact the bond interest might have on your income. Whichever method you choose for reporting the interest you earn, you must use the same method for all the savings bonds you own. You may report savings bond interest annually on your tax return, as interest earned. Calculate the interest you’ve earned for all the bonds you own and report it on Schedule B of Form 1040. You should state on your return that you’re choosing to report your bond interest as accrued each year. If you own a large amount of bonds that mature at the same time, reporting the interest yearly protects you from a large increase in your taxable income when you cash in the bonds. You also have the option of waiting until you cash in your savings bonds and reporting the interest you receive at that time. This method is easier, because it doesn’t require looking up accrued interest; the Treasury Department will send you a 1099-INT the year you cash in the bond, which shows the interest you received. If you use the interest to pay for higher education expenses for you or your child, you may not owe taxes on the interest at all, because the IRS exempts savings bond income used to pay for education. If you think you may use your savings bonds to pay for education, wait to report the interest when you receive it. If you initially decide to wait to report the interest on your savings bonds when you receive it, then decide you’d prefer to report the interest annually, simply begin reporting the interest on your next tax return. The first year, report all the interest accumulated by the bond to that point. Once you’re committed to reporting the interest annually, the only way to switch to reporting interest when you cash in the bonds is to write to the IRS and request permission. Information about how to contact the IRS and request the change is included in IRS Publication 550 – Investment Income. Who Pays the Tax on Savings Bonds Held Jointly?